By Asato Asato and Shirabii. Released in Japan by Dengeki Bunko. Released in North America by Yen On. Translated by Roman Lempert. I have a certain reputation for being a softie, and will freely admit that I drop series sometimes just because I find them too bleak and depressing – in fact, see my review of WorldEnd a few months ago. But sometimes I get a book that, even though it is unrelentingly downbeat and cruel, I end up enjoying far more than I thought, simply because the writing is so damn good. Such a book is 86, a blunt look at war and racism seen from an alternate universe that seems eerily close to our own at times. It examines how easy it is for people to fall into hatred and murder, how being idealistic and thinking something is wrong is not really enough when you’re in a position of great privilege, and the constant physical, mental and emotional strain of being a disposable soldier whose “leaders” want them to die. I was depressed while reading most of the book, but I absolutely could not put it down. It’s stunning. The Republic of San Magnolia is at war with the Legion, weapons of the Empire. Fortunately, they have unmanned drones to fight the battles for them! Unfortunately, their technology isn’t great, so their “unmanned” drones are manned by the Eighty-Six. There are 85 Sectors in the Republic, and it decided to take all those who weren’t “pureblood” and put them in an 86th, which is essentially a concentration camp, and send them out to fight the war. They’re not people, after all, just subhuman pigs, so it doesn’t matter what happens to them. Our story follows Lena, a young idealistic “handler” who thinks this is wrong, but also thinks that she can do something about it by virtue of forcefully making her point. She’s assigned to a new group of Eighty-Six, the crack squad who are on the front lines preventing an invasion of the Republic. Unfortunately, her squad is getting diminished by the day. And they have no respect for her. And the enemy are horrifying. I hate to repeat myself, but I don’t think I’ve been this blown away by a first volume in quite some time. 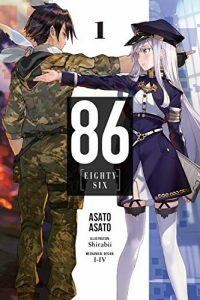 If you are tired of isekais, or tired of fascism, or just love good prose, and don’t mind a lot of death and degradation, 86 is absolutely a series you should be reading. Highly recommended.